Gastroesophageal reflux disease (GERD) occurs due to the return (reflux) of stomach and duodenal contents into the oesophagus, mouth and the airways. There are several causes that can lead to a reflux of stomach contents, but the most important one is dysfunction of the lower oesophageal sphincter (LES). LES is the muscle that closes the bottom of the oesophagus and prevents the return of gastric contents into the oesophagus. When eating, the act of swallowing causes a physiological relaxation of this muscle which lasts for 5 to 10 seconds and allows the passage of food from the oesophagus into the stomach. In case of gastroesophageal reflux disease, due to functional disorders of LES, the return of gastric contents (reflux) lasts longer. The irritating effect of the acid content on the oesophagus, mouth and airways leads to problems (symptoms) in patients. There are numerous signs and symptoms which suggest GERD, while their severity does not always correspond to the degree of damage to the oesophagus, mouth and the airways mucus. Their common characteristic is that they diminish the patient’s quality of life to a smaller or larger extent. Scientific data indicates that in the western world, symptoms of GERD occur in up to 20% – 40% of adults. The most common typical symptoms of GERD are: heartburn and regurgitation of stomach content into the oesophagus / mouth. A heartburn is a condition characterized by a burning sensation behind the sternum that extends to the neck, and usually occurs after meals. Regurgitation is a sudden return of a small amount of acidic gastric contents into the mouth. Less common symptoms which may be caused by gastroesophageal reflux disease: asthma, hoarseness, chronic cough, chronic laryngitis, chest pain, damage to teeth, hiccups, excessive salivation. These symptoms are also called atypical because they do not refer directly to GERD. Due to the constant irritation of the oesophagus mucus with the acidic gastric contents, some complications may develop in the oesophagus in the form of inflammation of the oesophagus mucus, or ulcers on the mucosa, stenosis, and changes in cell structure of the lower oesophagus called Barett’s oesophagus. The least desirable complication is the change in cell structure (Barett’s oesophagus), because the transformation of such cells into malignant ones (causing malignant disease) is 30 to 125 times more frequent than in healthy individuals with an unchanged mucosa. The diagnosis of the disease is usually based on symptoms. If heartburn is the leading or the only symptom, it may be concluded with great certainty that the patient has GERD. Only in a small number of patients a specialist gastroenterological examination, including an endoscopic exam, is needed. The goal of GERD treatment is primarily to cure and prevent the development of changes in the mucosa of the oesophagus, mouth and the airways, as well as complications of this disease. Given that most patients have a milder form of the disease and no serious damage to these systems, the main goal of treating GERD is to relieve patients of symptoms that impair the quality of life and prevent the recurrence of symptoms. Today, several groups of medications are used for the treatment of GERD: antacids (neutralizing the effects of acid), inhibitors of acid secretion (H2 antagonists, proton pump inhibitors) and prokinetics (accelerating the emptying of the oesophagus and stomach). Those most effective and most commonly used are proton pump inhibitors. These drugs do not reduce the return of gastric contents into the oesophagus, but reduce the acidity of the contents by decreasing the irritating effect of the acidic content. Proton pump inhibitors (PPIs) are very effective in treating GERD and are well tolerated. Treatment with PPIs is carried out for at least two months. In case of symptom recurrence after discontinuing the therapy with PPIs, it is recommended to use these drugs in one of two ways. One way is to constantly take the minimal dose that relieves symptoms for several years. Another way is to take the drugs occasionally over a certain period after the symptoms appear. The choice between one of these long-term GERD treatment types should be left to the doctor. eat fewer meals several times a day, avoid large meals before going to bed, stop smoking, avoid bending and doing work in a bent over position, avoid coffee, tea, carbonated soft drinks, alcoholic drinks and greasy and spicy food, and sleep with a raised headboard. JGL’s RefluSTAT contains alginates and carbonates for a quick and efficient mechanical blockage of the return of gastric juice into the oesophagus. When the product comes into contact with the acidic pH values of the stomach, the sodium alginate is precipitated to form a gel. Meanwhile, the carbonates present in the product release carbon dioxide that allows the gel to rise and form a plug. It represents the physical barrier and prevents the return of gastric juice to the oesophagus. In addition, sodium bicarbonate helps in reducing gastric acidity. 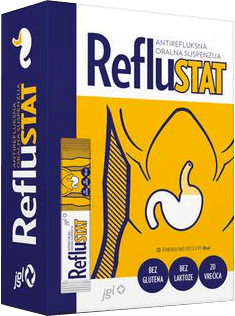 RefluSTAT reduces symptoms such as heartburn, heartburn during pregnancy, the return of acid from the stomach into the oesophagus, indigestion, cough and irritation of the throat and pharynx quickly and efficiently.